Norwegian Film Festival: Andreas Award, Richard Eyre; Chlotrudis Awards Nomination: Best Actress; London Critics Circle Film Awards Nomination: Young Performer of the Year; 2 other nominations. What should take preference: the laws of society or the tenets of a religion? When should a child be granted permission to make “adult” decisions? Do beliefs trump facts? 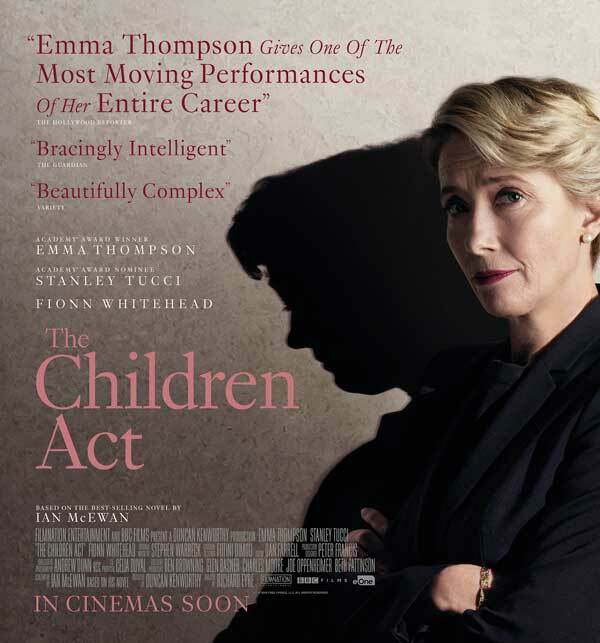 In this smart adaptation of Ian McEwan’s 2014 novel, “The Children Act,” Emma Thompson plays a British High Court Judge tasked with rendering a decision with, literally, life and death consequences: whether a 17-year-old Jehovah’s Witness (Fionn Whitehead) should be forced to receive a blood transfusion, against his will, that will potentially save his life. So devoted is Fiona to the cause that she has let her childless, 30-year marriage to husband Jack (Stanley Tucci) fall by the wayside. This neglect prompts Jack to genially ask permission to seek sexual gratification elsewhere with a younger woman, which prompts Fiona to file for divorce. In an unprecedented move, Fiona visits the boy in the hospital, trying to understand why this talented, young poet and musician would choose to let leukemia do him in at the expense of a full and promising future. Fiona’s decision affects her own life as powerfully as the boy’s. Thompson reveals a woman buffeted by forces she’s laboured for decades to keep at a safe distance. While Whitehead and Tucci are both very effective, it’s Thompson who carries the film, both literally and emotionally. Her burden here weighs down almost every line of dialogue, registers in almost every expression on her face. This is acting of the highest order.